Every Friday, we tweet a new tip to help you live a healthy lifestyle. Click here to follow us on Twitter. Here are physical health tips from last month. Click on the tip to go to the original source of information. Find a challenge to help you stay motivated in fitness – whether it’s competing with a friend, training for a 10k, or even improving the time you can hold a plank. Before spending money on another detox or cleanse diet, learn about the body’s own self-cleaning process called autophagy. Regular stretching can reduce neck pain and improve mobility. Help yourself age gracefully by exercising regularly so you can continue to live independently as long as possible. 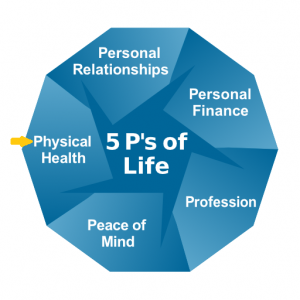 One of the 5 P’s of Life is “physical health.” Staying healthy is important and impacts all aspects of your life – including your wallet with increased healthcare costs.